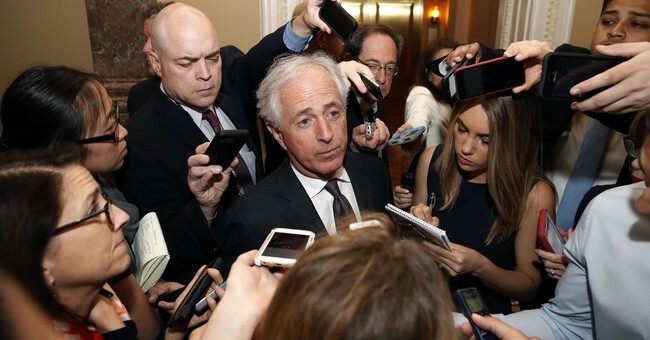 Sen. Bob Corker (R-TN) took a defeatist attitude at an event in Chattanooga Friday when asked about Congress's attempt at fiscal responsibility. "Nobody cares," he told the audience. A local reporter also confronted Corker about fiscal spending. "It sounds like you've given up" on it, she noted. "There are so many other issues that we have to deal with and we're fully engaged in solving problems," Corker admitted. He's "discouraged" by the lack of urgency among his fellow Americans to address fiscal issues. He still believes it's the nation's "biggest threat," but "it's not what the American people are focused on right now" and therefore Congress has put it on the back burner. Corker, who is set to retire at the end of his current term, is one of a few Republican congressmen to publicly spar with President Trump, well before he accused Trump of neglecting fiscal responsibility on Friday. Trump told his Twitter followers last year that Corker “didn't have the guts” to run for reelection next, so the senator called the White House an "adult day care center." Trump responded by accusing Corker of helping enact his predecessor's "bad" legislation. He also said he couldn't get elected "dog catcher" in his state.